Click the wrench icon at the top right corner of the screen and go to Tools > Clear Browsing Data. 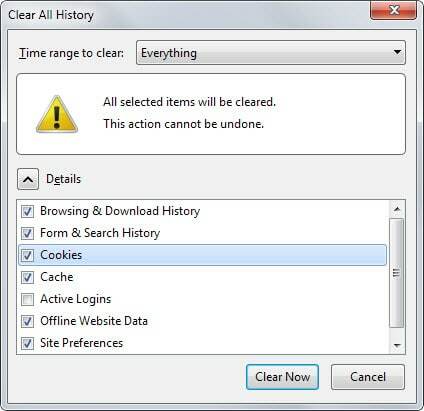 Select the items you want to delete, choose the period for which you want to delete them and click Clear Browsing Data. See video how. Open Firefox and go to History > Clear Recent History. Choose the time range and the items you wish to clear and click Clear Now. Web Storage, also known as HTML5 Storage, Local Storage or DOM Storage, offers a way for web applications and pages to store data locally in web browsers. The data that is stored is persistent meaning that it does not expire with a session. If you browse away from the site that saved the data or close the browser, you will notice that the data is still there when you open it again or check for it locally. The storage option is supported by all modern browsers, even mobile ones, and just like cookies, is used for good and bad. The Web Storage specification on the W3C website has a whole chapter about privacy implications and solutions. Basically, web storage can be used to track users on the Internet. It is actually pretty easy to find out if a website uses Web Storage. If you are using Firefox, press F12 to open the Developer Tools of the browser. Switch to storage and open Local Storage when you are there. If Storage is not available by default, open the settings of the browser and check the feature so that it becomes available. If you are using Google Chrome, press F12 as well and switch to Resources > Local Storage in the browser to display the information. Note that this reveals information about the active web page only and not about other sites in the browser. Chrome users can load chrome://settings/cookies in the browser to display all sites that have stored local storage (and cookies and other forms of storage) locally. You can delete the storage in most modern browsers. The following guide applies to Firefox, Chrome and Internet Explorer, the three most widely used browsers. Warning: The process will delete cookies and local storage. This means that it will remove session cookies which in turn means that you will have to sign in anew to websites and applications. Press Ctrl-Shift-Del to open the Clear All History menu. Make sure you have selected Cookies and that the time range is set to Everything. Note: Only Everything removes local storage, any other time frame does not. Use this bug to track the issue. More Information about Local Storage in Firefox here. Alternative: Volatile Storage add-on which you can use to clear Local Storage manually, or automatically on exit or start of the browser. Press Ctrl-Shift-Del to bring up the Clear browsing data page in Chrome (this works in other Chromium-based browsers as well). 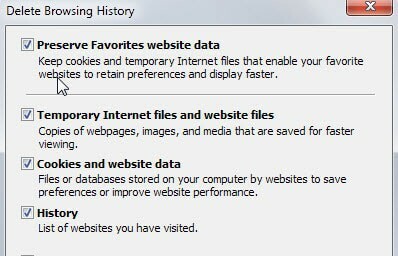 Make sure Cookies and other site data is selected. Change the time frame at the top to “the beginning of time”. Click on Clear browsing data to start the process. Note: You can delete individual local storage data by loading chrome://settings/cookies. Tap on the Alt-key to display the menu bar. Select Tools > Internet Options from the menu that opens up. 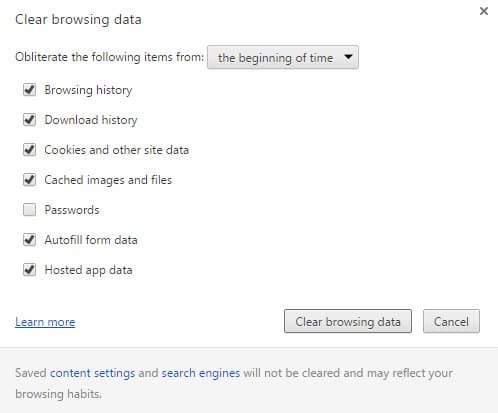 Check “delete browsing history on exit” under General. Click on the delete button afterwards and make sure Cookies and website data is selected. If you don’t want to keep the data for sites in the favorites, uncheck “Preserve Favorites website data” at the top.